In a perfect world, every sales order your company receives would be electronic. Each one would arrive in the same format, with all the necessary information clearly defined, and feed directly into the ERP system through electronic data interchange (EDI) without any hiccups. If your company wants to eliminate the problems caused by fax and email orders, there are many factors to consider. 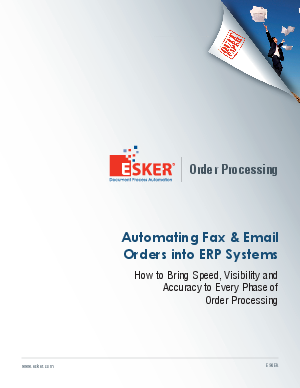 This white paper explores those factors, while highlighting how specific automation solutions can deliver cost savings and process efficiencies via the electronic processing of fax and email orders into your ERP system.